Laser marking is often used to showcase a product name or logo on a product. It can also be used to identify part or batch numbers. Using C02 and fibre lasers we are capable or marking many different materials. 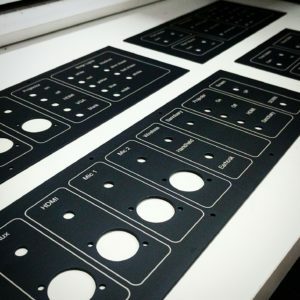 We specialize in custom laser marking on anodized aluminum, stainless steel, plastic and more. Contact us for a quote for marking your parts. Be sure to include a drawing or photo of the part, the artwork (preferable an Illustrator or Photoshop file), the qty required, the date you require the parts to be finished. Contract orders often include free fixturing! We work with customers all over North America. We have excellent courier rates (UPS, DHL) for small projects, as well as great LTL rates for large scale projects.